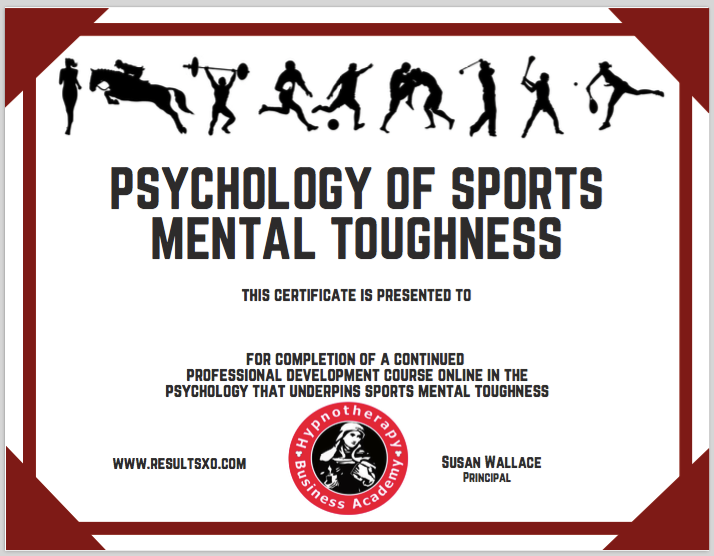 Welcome to the Certificate in the Psychology of Sports Mental Toughness. My name is Susan Wallace. I'm the Invisible Edge Coach and I will be taking you through this course over the next 6 days. 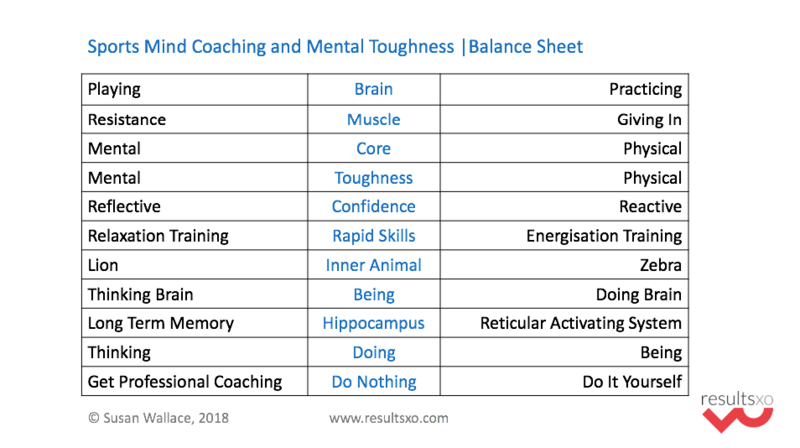 Below you'll find the video lessons to help you explain the psychology behind Sports Mental Toughness to your clients. Every lesson comes with short videos plus also with the audio file if you prefer to be active while you learn. Also included is the transcript if you prefer to read rather than watch. 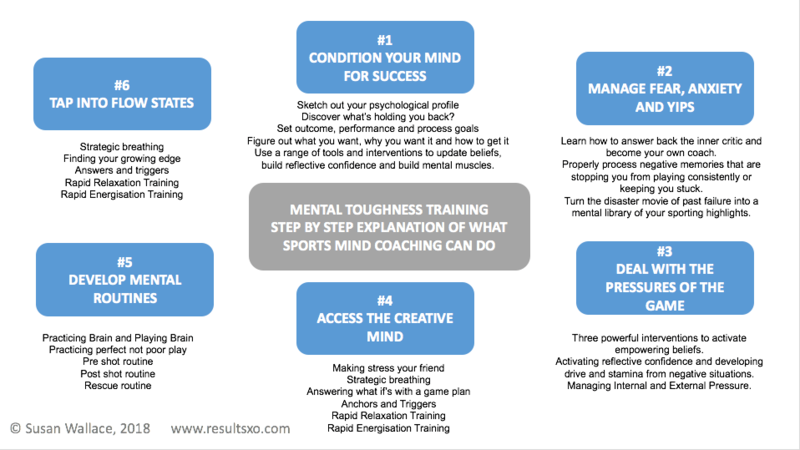 What Does a Sports Mind Coach and Mental Toughness Trainer Do in Session 1? What does a Sports Mind Coach Do in Session One? 1. The first thing we need to do is to sketch out your unique psychological profile over six domains and find what I call your strengths and your stretches. 2. The next thing we need to do is to figure what’s holding you back? What’s stopping you from reaching your full potential? Your physical coach is helping you develop your physical muscles and your technical skill. But your Sports Mind Coach will help you develop your mental muscles. 3. Thirdly, a Sports Mind Coach will help you set some goals, figure out what you want, why you want it and most importantly HOW to get it. What is Flow? Listen to Tiger Woods describe the experience of flow and the positive effects of Sports Mind Coaching. What happens when you’re in flow? You let the training take over and just let it happen. But to get to a flow state, and maintain a flow state and regain a flow state requires confidence and mental toughness in all areas of your game. First off, a Sports Mind Coach will help you become more aware of how your inner critic is putting you down and how it is causing mental interference. Because chances are you’ve got used to the inner critic being there in the background and you haven’t yet figure out how to answer it back. Build awareness of your inner critic and how it is putting you down and how it is causing mental interference. Learn how to answer it back. Find the intervention that is right for you to turn those disaster movies into a collection of your greatest hits. Stat building a mental library of all the times you’ve executed a great shot, pass or a put with perfect precision. Make sure you’re brain is working with you instead of against you. Learn how to quietly savor and appreciate how well you can do when you’re relaxed, focused and in the zone. Access your creative mind so you can finish the unfinished business of the past and put past failures where they belong – behind you. This means you’ll have the skills to properly process negative memories and experiences that are stopping you from playing consistently or are keeping you stuck. Use your creative mind to help you return to a more intuitive way of playing. So that you’re more focused on the process and looking forward to the challenge of a tough game with tough opposition. Here's how I describe what we do to a new client... and what students learn on the diploma course..
First of all we need to install some empowering beliefs and remove unhelpful beliefs that are keeping you stuck. Condition your mental muscles with the confidence of believing that you’ll perform well in every situation including the ones that frustrate you and anger you. You’ll learn the techniques to just ‘let it go’ and stop your brain from fixating on the frustration that comes from feeling like you’ve failed, or fixating on confrontation or carrying aggression that can stop you from getting in the zone. Once you learn how to let it go, you’ll move out of having that survival response of muscles freezing and not delivering the kind of play you need and you’ll move out of feeling stuck, paralysis by analysis or being a victim of your own emotions. One of the key skills is learning how to install a mental programme – a firewall to protect you from the fear, frustration, the confrontation and the aggression that you know are part of the game and give you the skills to reflect instead of react. Here's how I describe what we do to a new client... and what students learn on the diploma course. Firstly, by accessing the creative mind we can create powerful anchors to trigger feelings of inner calm, so you can experience a sense of flow and become fully absorbed in the task at hand even when you are under a lot of pressure to deliver. Your breath as you already know is the most powerful non-verbal communication you have. You can learn how to use your breath to instantly activate a state of focused energization or relaxation (whatever is called for) to meet the challenges and the pressures of the game. I call it strategic breathing. And a strategic breath will ventilate your mind. Clearing out the brain fog caused by over thinking and over reacting. A strategic breath will quickly bring your brain and body down out of the red, where you’re burning up too much fuel and mental energy, down past orange or high alert and back into the green – ready to play an intuitive game and flow with everything going on around you. These skills can’t be taught online. They require personal involvement because no two people are alike and everything has to be tailored to meet the challenges you face and the personal and professional goals you want to achieve. If you were here with me, if you’d booked yourself in for a session or if you were in class with me learning how to be a Sports Mind Coach and Mental Toughness Trainer, we would be focused on giving you two skills that every top athlete pays top dollar to master. The next thing we have to do is to take action and to develop simple routines. Mental routines that won’t take any longer than 30 maybe 40 seconds of your time. Of course the first thing we have to do is to design the ones that are right for you, then we have to implement them and activate them. 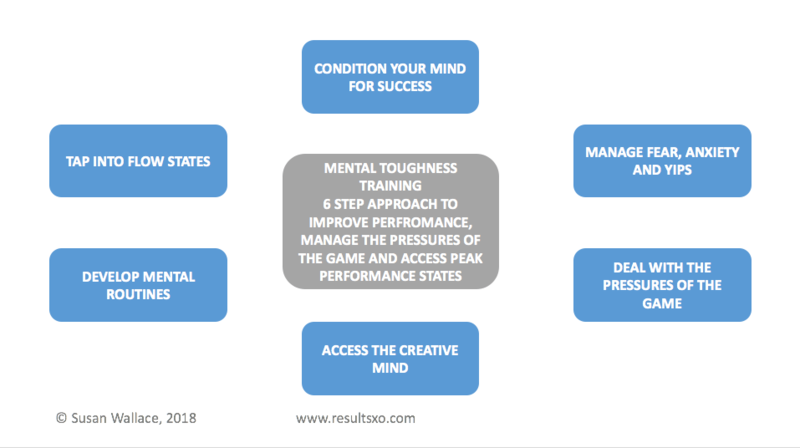 This is where you need to work in-person with a sports mind coach and mental toughness trainer so that these mental routines can be built into your training regime and so that we can get them activated so they can become a strategic part of how you manage the pressures of the game. Knowledge that your best will always be good enough. That you’ll be intuitively able to switch between your playing brain and your practicing brain. Between your two mental muscles – giving in muscle and the resistance muscle. That you’ll be able to switch between the reflective brain and the reactive brain when you need to and that you’ll have instant access to rapid relaxation or rapid energization as circumstances dictate. And just as you work hard conditioning your body, building your strength, endurance and stamina, that you’ll add an additional 30 to 40 seconds on to your training routine to build mental strength, endurance and stamina so you’ll have the mental toughness you need to manage the pressures of the game.